In this fourth installment of E&M‘s exclusive series about the current situation in Ukraine “On the Brink”, Christian Diemer takes a trip to the former presidential residence in Mezhyhir’ya, not far from the Ukrainian capital. A girl in a headscarf is waiting where the buses leave for the president’s former residence. “No, I am not going to the residence, I live in Mezhyhir’ya.” Ayya, 28, is a refugee from Donetsk. “I always wanted to live in Kyiv once in my life. And my family has come with me. So I am OK with that.” Ayya is studying to become a dentist, but the university in Donetsk is no longer functioning. She moved to Kyiv just in time to register for the winter semester, which began a couple of weeks ago. “Well, how do you think the situation is over there?! Terrible.” And whose side is she on? Instead of an answer, Ayya points at her backpack, where a blue and yellow ribbon is fixed. At the entrance to Yanukovych’s residence, there is row upon row of Ukrainian flags. To call the premises vast does not come close to doing it justice; even to mention its size in hectares barely evokes the true scale: vast is only a word, 138 is only a number. An entire zoo with exotic creatures is to be found somewhere. Waterfalls cascade down a slope decorated with pseudo-antique statues. A gigantic house is enthroned at the top of the incline, decorated with columns and pilasters. Built by a Finnish company and made entirely of timber, it is said to be the largest wooden house ever constructed. The black and red flag of the Ukrainian Insurgent Army (UPA) flutters on its roof. Since the revolution, the estate has been transformed into a local holiday spot and a museum of the former president’s sumptuousness at the expense of his people. The residence is supposed to have cost 60 million euros. Some chandeliers are worth 100,000 euros alone. The average salary in Ukraine lies between 150 and 200 euros. Across an artificial river, a bridge leads to the presidential bathhouse. 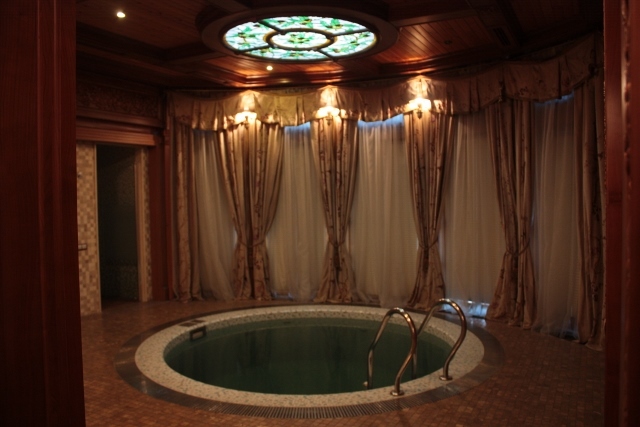 From the bottom of a perfectly circular pool, iridescent mosaics look up at tiled walls and columns. In the Finnish sauna, a “V” has been engraved into the wood – both the president’s first initial and the symbol of victory. The Russian smoke sauna is opposite. It smells of old wood, herbs and relaxation. Horoscopes are being broadcast on a flat screen television in the anteroom, which was designed to give visitors a place to take it easy after their bath or steam. Kyiv’s skyscrapers appear in front of us. I cannot find the seatbelt, and for some reason I don’t want to find it. In a sudden impulse, I sense freedom, and a deep, painful love for this country and its people.